Drain off any oil on the top of the peanut/almond butter. In a small saucepan, melt butter over medium-high heat (heat until it turns brown, not black). Add natural sweeteners until sweeteners dissolve and the mixture bubbles just a little. Using a hand mixer on low speed, add in extract and peanut butter. Place in the freezer or fridge to chill completely. Line a baking sheet with wax paper/parchment paper or foil. Make 1 inch balls out of the pb mixture and put on the wax paper. set in freezer for 5-7 minutes to chill for easier dipping. While balls are chilling make the chocolate coating. In a small saucepan over medium heat, stir together the heavy cream, natural sweeteners and extract. Bring to a light simmer then remove from heat and add the finely chopped chocolate. Stir until smooth and the chocolate is totally melted. Remove balls from freezer. 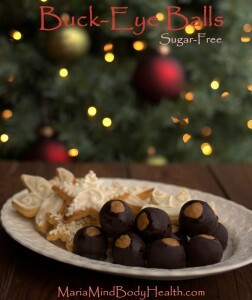 Insert toothpick or wooden skewer into a ball and then dip into the chocolate turning quickly to cover the ball (can leave some almond butter ball showing...don't have to cover the whole ball if you don't want) Place onto a 2nd tray that has also been lined with wax paper/parchment paper or foil. Let sit to dry or refrigerate for faster drying.